Everywhere you look there are pins and posts about the “25 Things You Have to Know About Harry Potter World” or “What only True Harry Potter Fans Notice.” It’s true there are minute details all over the park, but in reality it’s too crowded to see everything unless you have weeks to spend at the park. (So congrats all of you people that have season passes and live locally). I however had 3 days, 2 kids, and 1 husband that’s not a Harry Potter Fan. So I had limited time to fit everything in, but being the super nerd I am I wanted to hit all the high points. Let me just say– it is amazing. It took me 10 hours to get there stuck in a car with a 5 and an 8 year old and it was worth every second. It looks just like how I imagined it and everyone that works there does a great job staying in character. We went straight to Olivanders and got our wands, but even though I thought I’d researched how it all worked it was super confusing. You get to go through and meet a wand maker and a couple of lucky kids get chosen to select a wand. 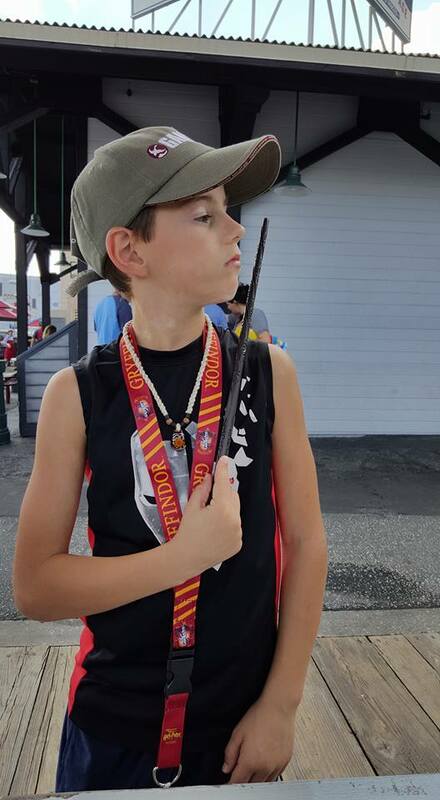 For an adult this feels slightly cheesy, most the of the dialogue is straight from the book, but the look on my kid’s faces when they though the wands really were doing all of that was priceless. 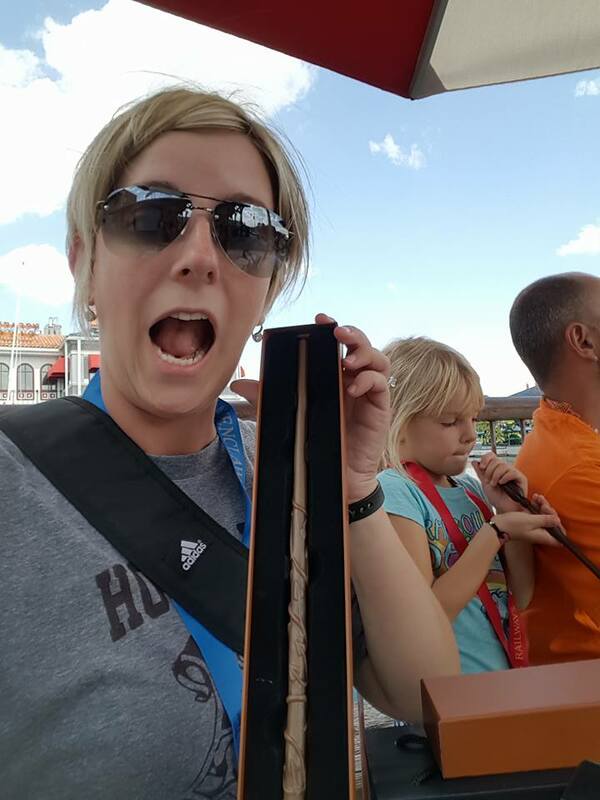 We went out into the main store and quickly threw down $50 a wand for interactive wands (btw some of the wands they sell don’t activate the special stuff they have set up throughout Diagon Alley or Hogsmeade– they don’t explain that well). 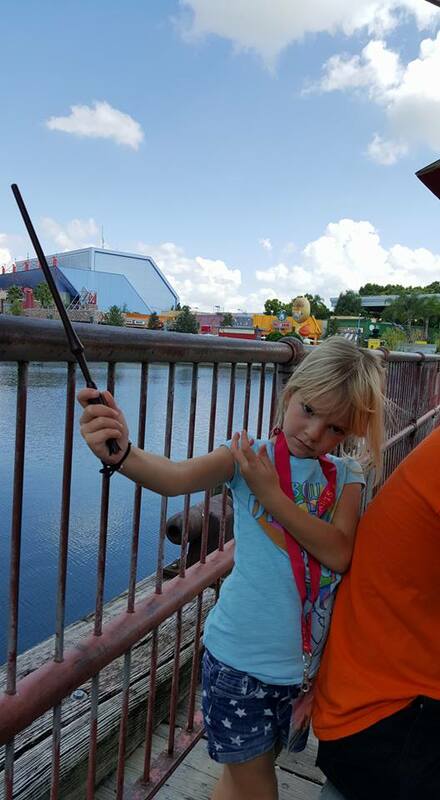 The kids that get chosen have the light shine on them and the wind blow a little and my kids were a little disappointed that when they chose their wands the same didn’t happen to them. 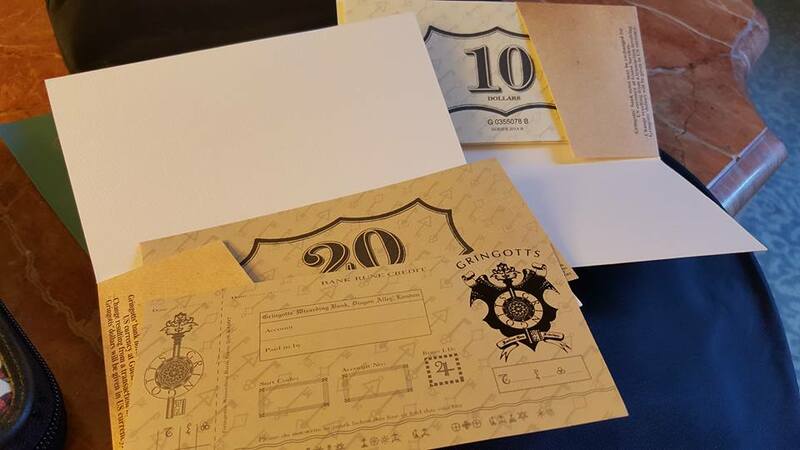 Now I know it would add another line, but maybe just in the Olivanders main show they could have an area where you could “check” your wand to see if it was a good fit. To go along with this vein of though it would be super helpful if you had a short (optional) “class” to learn how to do basic spellwork (aka how to activate the special areas throughout the park). I spent $150 on wands and then had to stumble through a few attempts before someone who worked there gave us a 20 minute tutorial. Also those areas are crazy specific. 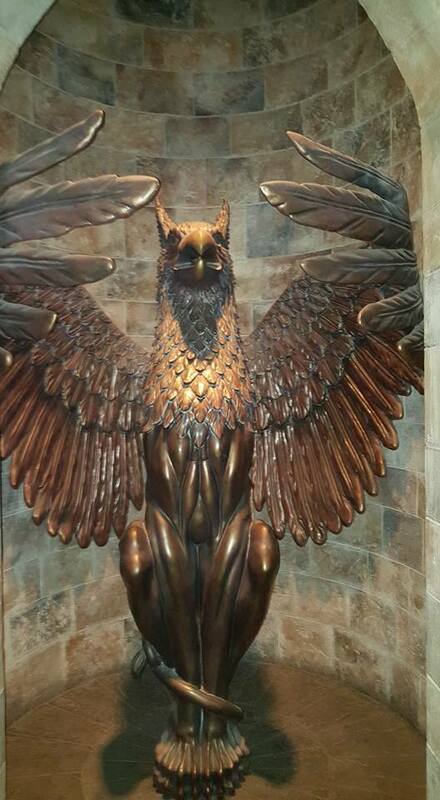 You can see the sensors if you know where to look and you have to point your wand very specifically at them and then move your wand in the exact precise way that the medallions show. That’s great for a 32 year old (although even I had trouble at a few spots), but my kids had issues getting them to activate. They weren’t the only ones and that caused long lines at every spot. Come on Universal– an “intro to spell work class” would be yet another attraction and the people you’re paying right now as already doing this on a much smaller scale. 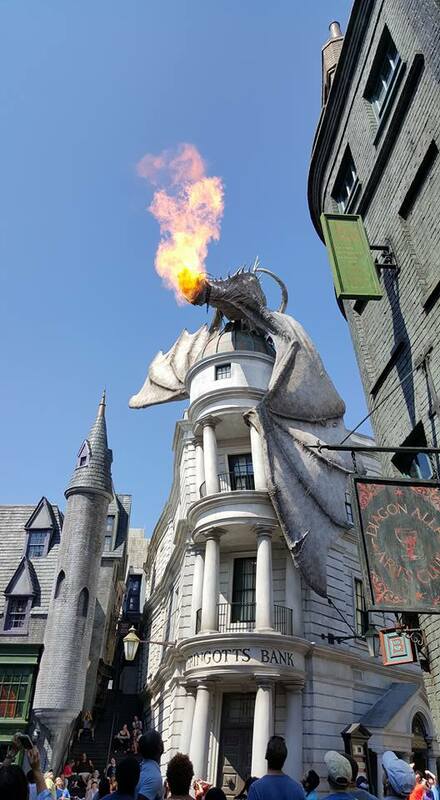 Then we watched the Dragon on Gringotts breathe fire a few times, looked at robes, but I couldn’t bring myself to throw $100 each at robes when I could totally make my own– you know in the event that I need robes– which might 100% happen (plus it was wayyyy too hot to wear the robes around the park at this point), then after a quick trip to Weasleys’ Wizard Wheezes (which was cool to look at, but didn’t have as many practical joke items as I expected) we decided to take the train over to Hogsmeade— after a photo with the Knight Bus. 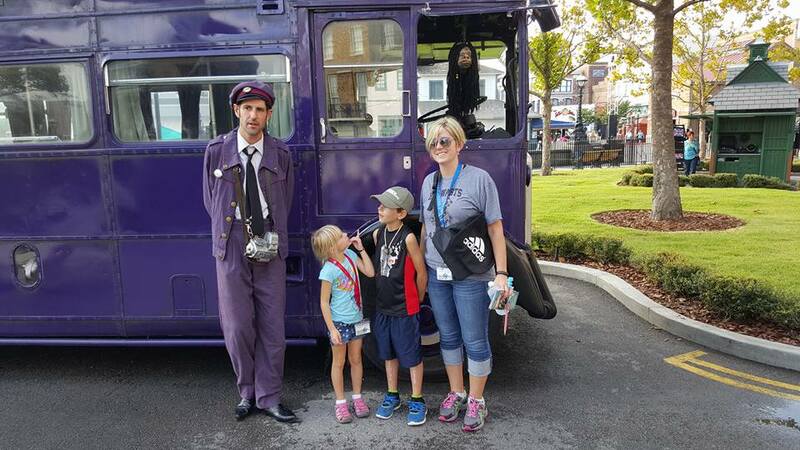 That was really well done and my daughter totally wanted to get a shrunken head like that (which I would have gotten her if it was available– once again Universal– sell that crap in Knockturn Alley with maybe a few Hands of Glory. The Train was evidently the hottest ride in the park as it was the lonnnnngest line we encountered the whole time we were there. After about an hour wait we finally made it to the train (there was even a snack bar set up mid line– really??) and the train ride was cute. 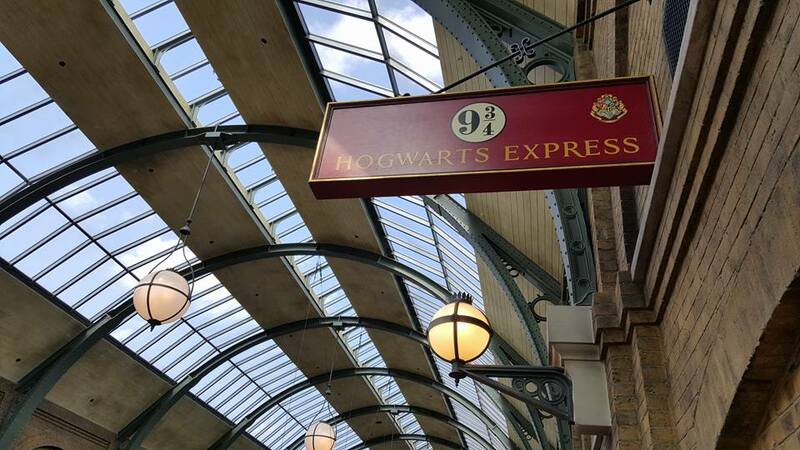 It helped make the trip over to Hogsmeade much more magical than just walking (which is what we did the other days after that wait), but I was sad it wasn’t really a steam train. It’s just a coaster track with a fake train that makes synthesized train noises. Which if you’ve never seen a steam train in person you’d probably not notice the difference, but I’ve been to Dollywood too many times to be fooled. A real steam whistle is a beautiful thing that you feel in your core when it goes off. 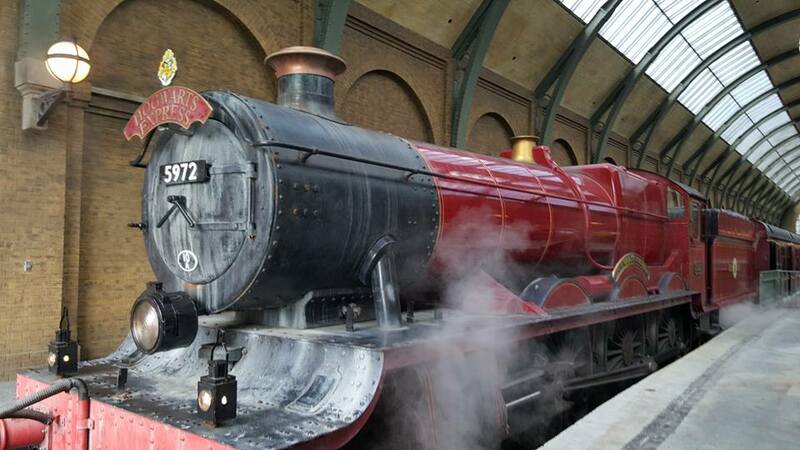 It was really cool though getting to board the train and ride it to the station. It did sound like they didn’t get Emma Watson to do her voice for the sound work on the train though which was odd. We were worn out at this point (did I mention that I have 2 small kids? Yeah they can only do so much and slow everything down) so we went back to our rooms to get to bed early so we could take advantage of our early entry passes (that came with our room package). 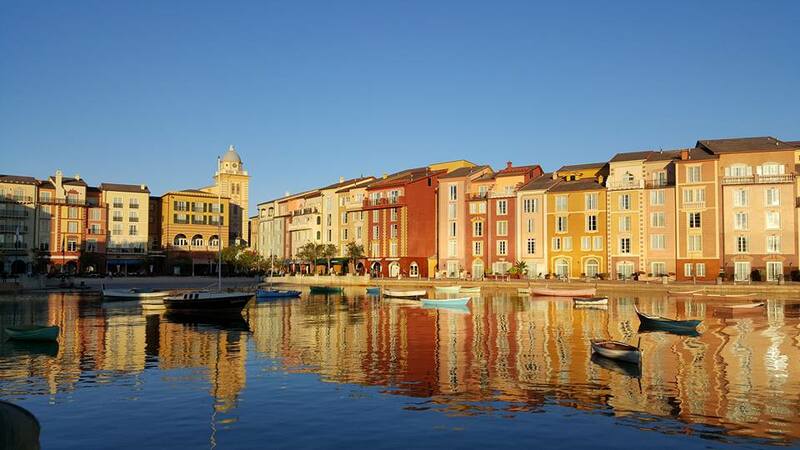 We stayed at Loew’s Portofino Bay Hotel which was gorgeous and we spent the extra to get the minon suite for the kids (it was our 10th wedding anniversary vacation so I didn’t want to have to sleep with my 5 year old every night) and that was also worth every penny. 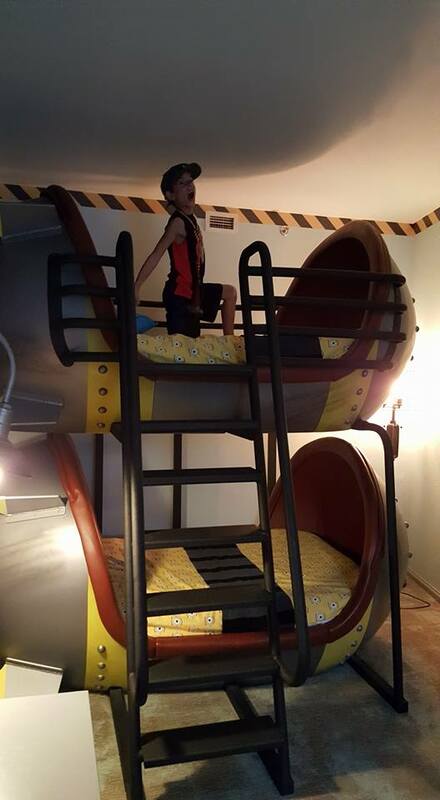 The kids were thrilled with their own private space. We tried to have a nice dinner that night too, but the service at Mama Bella’s was so insanely slow and half our food was cold when we got it. Not what I expected for a $150 meal. Then after waiting an hour for food the kids fell asleep right before the food got there. Really made me wish we’d just grabbed a sandwich as we were leaving the park. 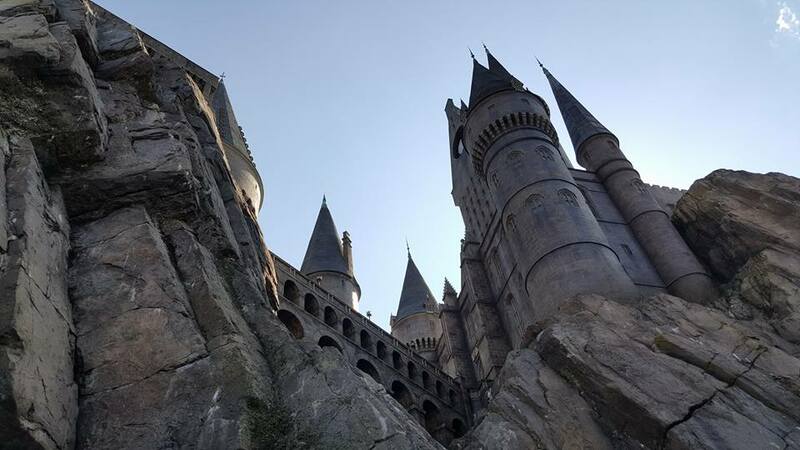 The next two days we tried to cram as much Harry Potter fun (and we explored the rest of the park too because my husband for some reason thought we came there for more than just Harry Potter– weirdo). The greatest thing we got that I didn’t realize we needed was the Express Pass. 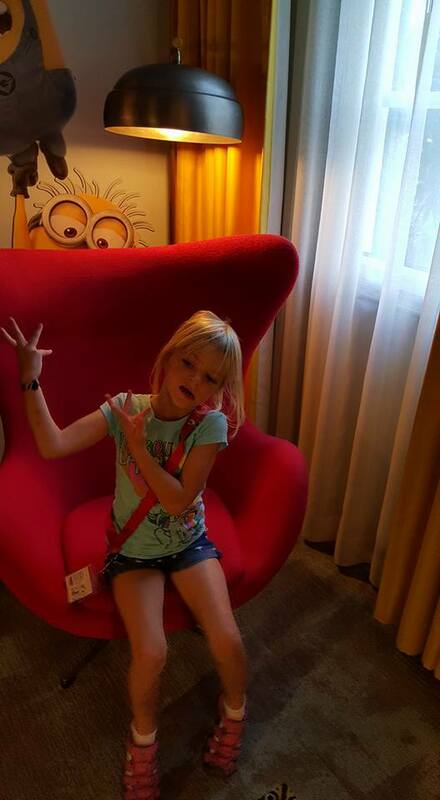 It came “free” with my hotel room and we rode rides multiple times in the time it took the regular line to get on the ride. I think they are about $60 extra, but it allowed us to do the park much quicker and was amazing since we were cramming everything into 3 days. Also you totally need the lanyards, but unlike all the “25 ways to do Universal on a budget” I don’t think you need to buy those ahead of time. They are only $10 or so and I totally bought mine before and left them in my sewing room so had to buy another set when we got there. I don’t think I saved any money on Amazon anyway. Off to Hogsmeade this area was just as amazing looking as Diagon Alley, but didn’t seem as fleshed out. There were multiple store fronts that were just false fronts. but I hope that Universal plans on filling those up eventually. 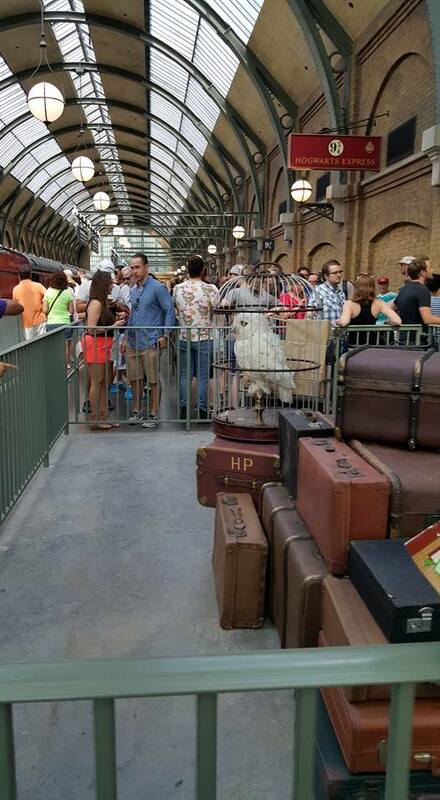 It looked like a nice large area, but in reality there were just a few shops and a lot of the wand stations (with long lines of people having issues making them work). The most amazing thing there of course though was the Castle. This was a long line too, but you don’t really notice the line since you’re busy looking at all the set dressing. The ride itself was cool although if that’s how hanging out with Harry goes I totally want to just hang out with Luna and talk about nargles. 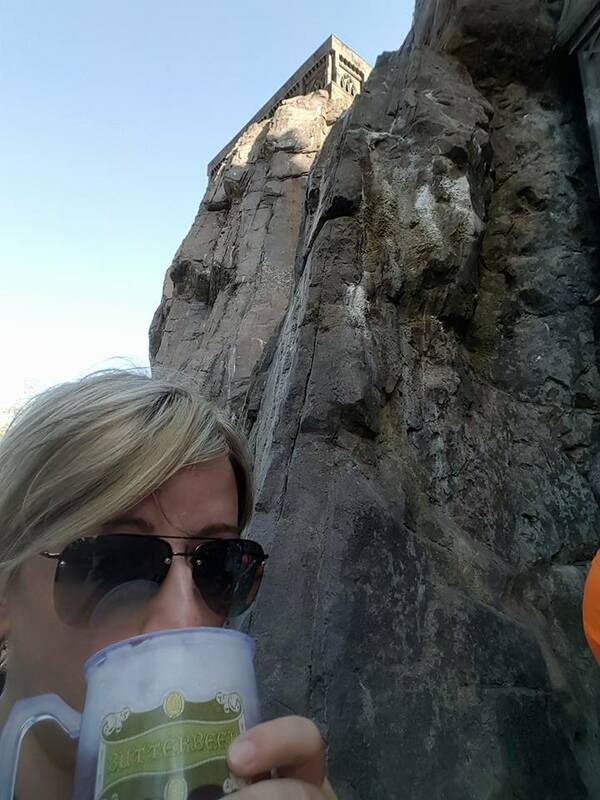 Of course I didn’t visit Harry Potter World without trying the Butterbeer. The books make it sound delicious and I have to say it looked good so I ordered a cold version and a frozen one. Verdict? The Butterbeer was disgusting. It wanted to be good– the cream on top was yummy, but overall it was nasty. Never fear though! A few of us get together every few weeks for Harry Potter Trivia nights (proof of this) and my friend Heather makes an amazing Butterbeer and a Butterbeer milkshake that will make your head explode. She follows this recipe which is supposedly modeled after Universal’s, but actually tastes really good. For the milkshake version– add ice cream before putting on the topping. Believe me it’s life changing. I do now own 2 Butterbeer mugs though which makes drinking the nasty version worth it. 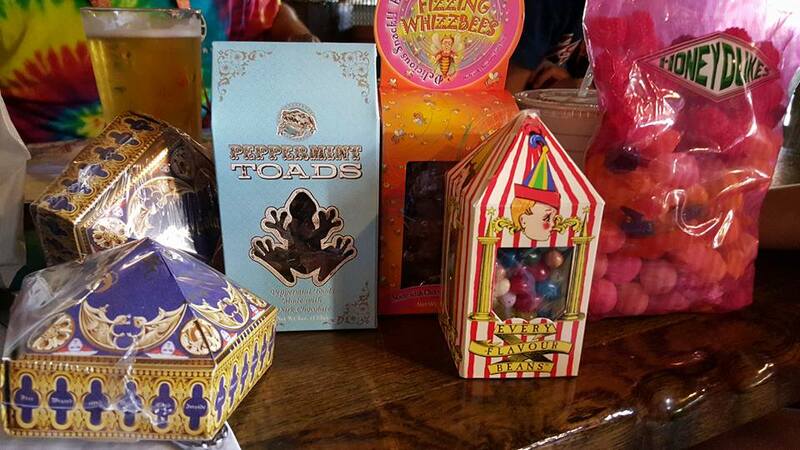 I may have lost control in Honeydukes though and bought way too much candy. The candy did not disappoint in anyway though. The Sherbet Lemons were delicious, the Fizzing Whizzbees I expected to be gross, but the mixture of pop rocks and chocolate was actually really good, and my son thought the jelly beans were hilarious. I was really impressed. Whatever I felt Universal was lacking they definitely made up for in the candy department. So totally read all the posts about all the little details you “can’t miss”, but just enjoy the park. Also don’t be those adults that crowd the little kids out of the way so you can try out your wand. I had a couple do that to my kids a couple of times. Seriously– I understand you have your wand and your robes, but dude you’re 30 and my kid is 5– it’s going to take her a sec to make the water shoot out of the fountain. Pay the extra for the Express Pass– or stay on site, it’s totally worth it. 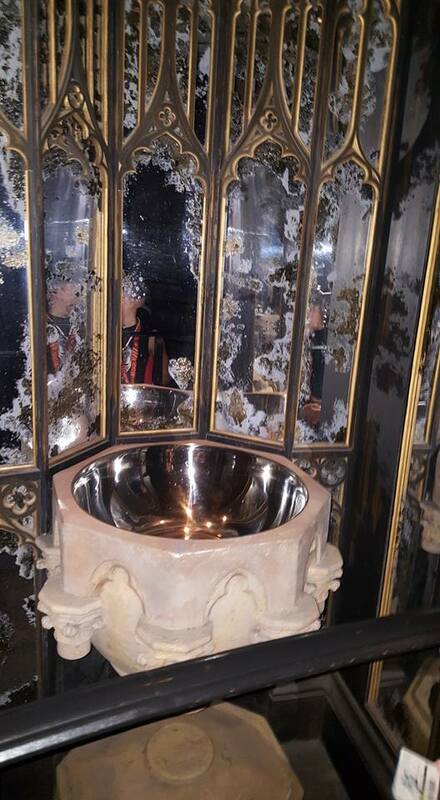 I look forward to going back in 5 or so years, or whenever they add the Ministry of Magic with it’s ride that you enter through the toilets and exit through the fireplace (I totally made that up, but it’s the next logical step). Ohhh or Grimmauld Place that is full of moldy furniture, a creepy Kreacher, and dark magical objects everywhere. The cave to get the horocrux with Dumbledore will probably have to wait until they can add another water ride like the Jurassic Park one. But I’ll be back when my kids are older, or when they add one of these rides. Whichever comes first.